Can I interest anyone in a spare seat? If you are interested, please go to the pictures on the right of this page, taken minutes before kick off. The crowds obviously wanted to flock to the stadium that holds 27,500......and gets an average crowd of little over 4,000. Now, why they decided to build a stadium this big for a team that can never realistically fill it unless they reach the Premiership (lmao), I'll never know. 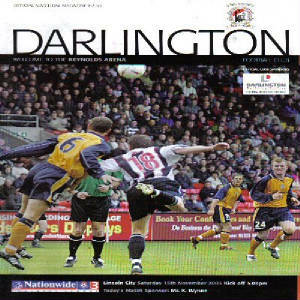 I never particully liked going to Darlington either here or Feethams, I just didn't see how it could possibly be a good trip even if we won. I remember when I became a regular Lincoln fan, Darlington were favourites to win the league, my how times have changed. Getting the ground is quite easy as it is located out of town and can been seen for a long distance around. Don't worry about getting there early because you'll still have plenty of chance to choose your seat. 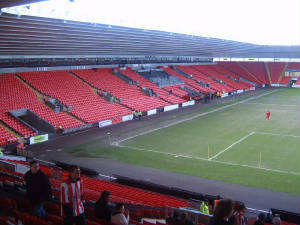 The ground however certainly lacks originality and feels like a smaller version of local stadiums, the Riverside of the Stadium of Light and this makes the ground feel pretty "samey" and takes away the aesthetics that the ground has. Describing the ground is quite easy, a big round, red bowl. Simple really isn't it, the only differences between the stands is what is written on them. 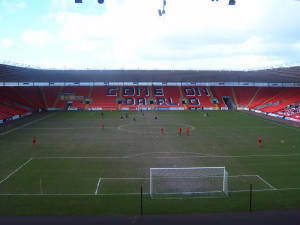 The one to our left had nothing written on it, the far one had "COME ON DARLO" written without middle allignment so it looks really silly, the EMPTY (as in not opened) stand to our right simply reads "Darlington" whereas the away fans section has "QUAKERS" written on it. The view of the action is very good and there is plenty of leg room and a good amount of noise can be created in the ground. 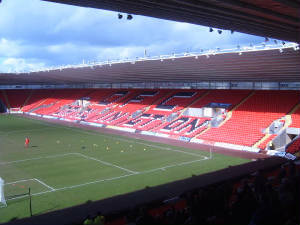 The atmosphere from the Darlington fans is practically none existent and I've seen them use the excuse that it's because their fans are seperated by a great distance. However, if that really was the excuse, why was there are poor atmosphere at Feethams? A ground that was as cramped as you get can get. One thing I did like about Darlington's new ground was in the corner next to the away fans, there is a large screen showing you action from the game that is on Sky before the match. This is quite good as normally you'd have to stay in the local bar to watch the game. It also shows you live action from the game you've come to see, however, they really need a new camera-man, or at least teach the current one where the zoom out button is. Overall, I'd be lying if I said that Darlington was one of the away trips I looked forward to during the season, mainly because I'm always ill when we go there but other than that, it doesn't feel like you're watching a football match and a stadium that big shouldn't be that empty.